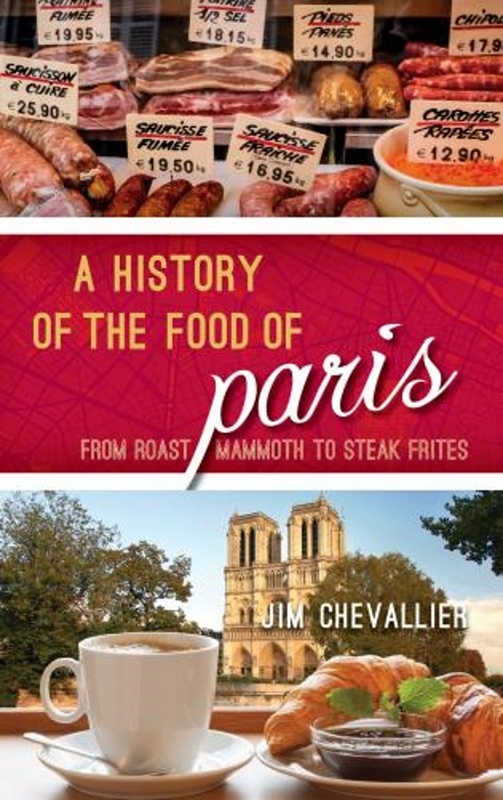 Order directly through Rowman & Littlefield at https://rowman.com/ISBN/9781442272828 for a 30% discount on A History of the Food of Paris. Use promotion code RLFANDF30 at checkout for 30% off – this promotion is valid until December 31, 2018. Videos from a variety of sources touch on Paris food history. This page groups links to some of these, grouped approximately by how the same subjects appear in the book. Paris' pleasures and pleasures: retracing the history of the Seine river banks - A look at the river's history and development. LA BIÈVRE : A LA RECHERCHE DE LA RIVIÈRE PERDUE - In search of the lost Bièvre river. La bièvre, une rivière disparue qui renaît dans le 13ème arrondissement - A brief but fun overview of the Bièvre and its history. with some old images and footage. Canal St.Martin - Paris - A boat ride down today's recreational Canal St. Martin. No commentary, just the ride. And accordeon music. Around the Canal Saint-Martin - A lively look at the area around the Canal St. Martin (with English sub-titles). Unusually, this stroll starts at the END, where the canal lets out in the Seine, and goes north. Discover another Paris: from the Marais to the Canal de l'Ourcq - A walk with an American jazz singer towards Napoleon's Canal de l'Ourcq. Brochet en Drop Shot! Canal de l'Ourcq PARIS - Catching pike in Napoleon's Ourcq Canal. Fontaine d'eau de source Paris 13 - A rare modern Artesian well in Paris. The growth of Paris - Paris - BBC - A brief and casual overview of Paris' development. La première enceinte médiévale de Paris - A rare look at the little-known walls on the Right Bank which preceded Philip-Auguste's. Philippe-Auguste fait de Paris une capitale - How Philip August made Paris into a capital. Paris au Moyen Age - A flyover of a 3D reconstruction of Medieval Paris. Sample of a larger work. Paris au Moyen Age - An animated reconstruction of Medieval Paris, with other images. Paris 3D: Through the Ages - Dassault Systèmes - A sample of a 3D recreation of early Paris. Paris: fouilles archéologiques au coeur de l'île de la Cité - Church of St. Eloi - but no Gaulish finds. Mur des Fermiers généraux - A very methodical look at the site of the old Farmer General's wall. You might want to look at a map of these walls before or while viewing this. au_bord_de_paris_H264-desktop.m4v - A short documentary on the walls of Thiers. Les fortifs.wmv - Another look at Thiers' walls. Paris: fouilles archéologiques au coeur de l'île de la Cité - Excavation of a sixth century church on the Ile de la Cité. A Visit to the île de la Cité - A somewhat longer visit to today's Ile de la Cité, with English sub-titles. Magdalenian - A dry but comprehensive overview of the Magdalenian culture. Paris et les derniers chasseurs cueilleurs - A video on the 2008 excavations of a Mesolithic site at the rue Henry-Farman. Musée Carnavalet (Paris) - A stroll around the Carnavalet Museum's collection of finds from the Neolithic site at Bercy. Musée archéologique de Saint Germain en Laye Les Gaulois.wmv - The antiquities museum outside Paris is well worth a visit. This is a look at its collection on the Gauls, which quickly gives some idea of how sophisticated their culture was. The Gauls: Ancient Culture Analysis - A methodical, if sometimes slow, overview of the Gauls; a good introduction for a newcomer. He does not emphasize however that the Gauls were Celts, which is important to know about their background. Les Gaulois au dela du Mythe - A fairly technical but interesting look at Gaulish life in detail. At 10:00, an experimental archeaologist discusses the food; at 13:37, there is another look at agriculture in the period. The piece also discusses the historiography of the Gauls; that is how certain received ideas were established in France. L'Europe des Celtes - La vie quotidienne des Celtes - This includes a look at the food of the Gauls through experimental archaeology. Some commenters accuse the video of being a little romanticized, so it should probably be considered in the light of other information. Quand Paris s'appelait Lutèce - An episode from French television exploring Lutetia, almost as if on foot, with a number of 3D recreations, and a look towards the end at finds at the College St. Barbe. De Lutèce Paris. Lorena Minguez. Travail numérique histoire de la langue I - A look at Lutetia (Gallo-Roman Paris), with a number of 3D recreations. Lutece 3D - A 3D reconstruction of Lutetia (used for a number of other pieces as well). 7 L'enceinte urbaine de Lutèce - A look at the walls which once surrounded the Ile de la Cite..
Aux origines de la Lutèce romaine - An exploration of an excavation on the Mount St. Genevieve of several Gallo-Roman houses and streets. Barbarians The Franks History Channel Documentary | The Roman War Machine - Over-dramatized, as are almost all documentaries on the Franks. But accurate enough as an overview. Fruit And Veg Market In Paris Aka Les Halles Paris (1917) - Silent, but a treasure. CRAINQUEBILLE - Les travailleurs des Halles de Paris à l'Aube en 1923 - Dawn at the Halles in 1923. Les Forts des Halles de Paris - A rare chat with one of the "forts" (strong men) who managed spaces at Les Halles. Les Halles, Paris 1931 - Over-dubbed cries, but lively shots. Les Halles : le marché - The market at the Halles. Paris La Vie Parisienne (1965) - 2:20 the Halles; 3:06 a meal. Les Halles : la vie ancienne - Two extracts from a 1969 documentary on the old Halles. many views of the buildings and activities even here. Some looks at workers talking in a local bistro. A Quick Visit to the Marché d'Aligre - One of the city's more lively markets. French women don't get fat. Parisians love affair with "bio", scenes from Marché Raspail. - The organic food market on the Boulevard Raspail. Le marché de St-Germain - The market on the site of the old St. Germain fair. Le Marché des Enfants Rouges - Inside the Enfants Rouges market (which also has a lot of outside tables). Marché des Enfants Rouges - A walk around the Enfants Rouges market, with some history of the attempt to close it. A Visit to the Rue Montorgueil - The very lively market street, the rue Montorgueil. Rue Mouffetard - The rue Mouffetard in 1959 (extract from a larger piece). 220 Marche Maubert Mutualite.MPG - Today's Maubert market, a direct descendant from the late Middle Ages. A Visit to the Rue Mouffetard - A walk from the Place Maubert to the rue Mouffetard. Market days can get busier than shown here, however. Clément Janequin: Voulez ouyr les cris de Paris - Medieval cries of Paris set to music. Traditional shopping galleries in Paris - A look at Paris' passages, the main elegant places to shop until department stores displaced them. RARE FILM DE PARIS EN 1920 - 5:40 Crepes and caviar at the Canneton, followed by the Robinson restaurant, cafe life, etc. Guy Martin au Grand Véfour - PdF TV - Chef Guy Martin talking about taking over the classic Parisian restaurant; mainly talk, though with some views of the restaurant. Le Grand Véfour - A step by step meal at today's Grand Vefour. BOUILLON CHARTIER PARIS 9ème 75009 SERVEUR AMAR Nº 9 - Stills and videos of one of the few surviving Bouillons. Chartier restaurant Paris (french) - A nice look at the Bouillon Chartier, with some Piaf in the background. Le Polidor. The restaurant in Woody Allen's "Midnight in Paris". - While the restaurant had a reputation long before Allen's film, this is as good a way as any to introduce it to Americans. Parisian Icon the Brassserie Lipp | euromaxx - A rounded look at a Parisian classic. Paris 1965 à l'heure du déjeuner | Archive INA - Lunch hour in Paris, 1965. Les crêperies du quartier Montparnasse - Creperies in their original Parisian neighborhood, near the Montparnasse train station. Gourmet Fast Food Trucks Are a Hit in Paris - An English-language look at food trucks in Paris, which have had uneven success. Notably some words from Kristin Fredrick, whose Camion Qui Fume was the pioneer of the genre. [La mode des food trucks à Paris] - Food trucks in Paris. La Folie Du Couscous Documentaire France 5 - A French TV documentary on couscous. Kabab Stand in Paris. - Some Americans at a kebab stand in Paris. Moroccan Chicken Bastilla (Bastila / Pastilla) Recipe - CookingWithAlia - Episode 62. - One of several videos in English explaining how to make this Moroccan specialty. This is one of the simplest and more straightforward. Chez Haynes-(Premier restaurant americain a Paris)-Zaia Lebtahi - A glimpse of Haynes' American restaurant when it was still in business. McDonald's lance un sandwich à la baguette - 2012 - McDonald offers a McBaguette (hamburger in a baguette). Saigon sur Seine - Vietnamese refugees in Paris in 1980. Un petit bout d'Inde à Paris au passage Brady - A close-up look at the Indian shops in the Passage Brady. Régine - Rue des rosiers (1970) - A 1970's music video shot on the old Rue des Rosiers. La rue des Rosiers est-elle toujours juive ? - Is the rue des Rosiers still Jewish?" - a documentary look at the change in the neighborhood. Rue des Rosiers - The rue des Rosiers today. Vidéo inédite du Pletzl - Rue des Rosiers en 1968 - The rue des Rosiers in 1968; look at a grocery at 6:30. Julia Child The French Chef- Your Own French Onion Soup - A classic dish from a classic cook. Steak Frites a la France Soir - A French cook explains a simple French dish. Eating a Croque-monsieur grilled cheese sandwich in Paris, France - A touristy close-up of a croque-monsieur. As good an introduction as any if you don't know the food. 10 Things to Eat in Paris for Under 5 Euros - A very pop introduction to some cheap basics. Creme Caramel Recipe - How To Make A Creme Caramel - How to make a "beautiful" creme caramel. Julia Child The French Chef- Apple Dessert - Making tarte Tatin. Balade dans Lamotte Beuvron - For hard-core lovers of the Tarte Tatin, a look at the town where it was invented (with a glimpse - no more - of the original hotel). Pubs des années 70 - French TV ads from the Seventies - most for food and drinks.